Baking is one of those things I do most during the fall and winter. I find it very relaxing and so fulfilling to bake something that my family will love. 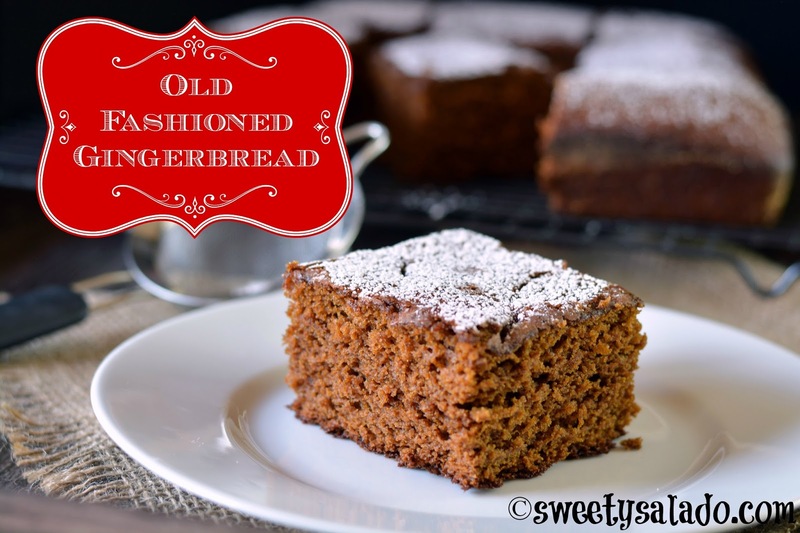 One of those things is this old fashioned gingerbread because I love anything made with molasses and cinnamon. Besides, all you have to do is mix everything together and bake. It’s as simple as that. 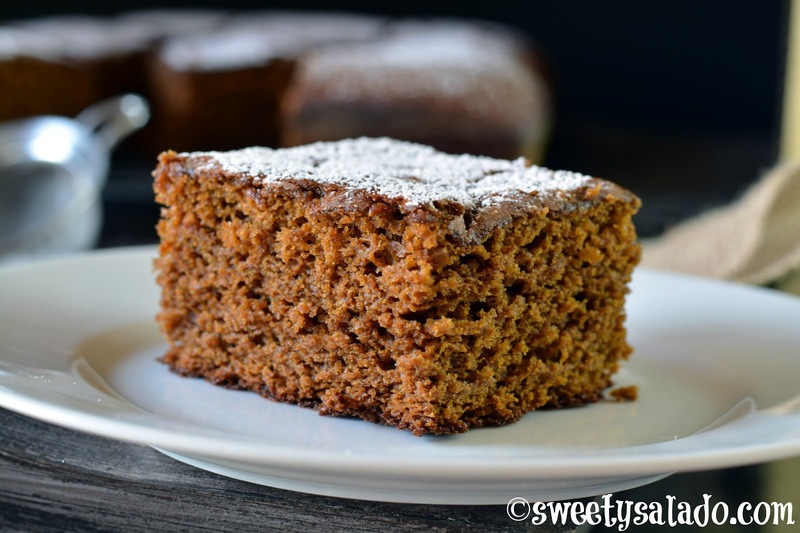 Gingerbread reminds me so much of the “cucas” cookies (say that three times in a row) that we make in Colombia because they’re also made with molasses. I’ll try to make them some time next year so you can see how similar they really are to this recipe. I know that a lot of you have told me that you stay away from making breads or cakes like this one because you don’t have an electric mixer at home. But don’t worry, you really don’t need a mixer to make this recipe, you can beat and mix everything by hand, it’s a bit more work but it will come out just as good. In a large bowl mix the flour, baking soda, cinnamon, ginger, nutmeg, cloves and salt. Whisk well and set aside. In a large mixing bowl cream the butter and the white sugar until creamy and light in color. Add the egg and beat for a few more minutes. Then, slowly add the molasses and beat until well combined. Lower the speed and slowly add the dry ingredients. Once everything is well combined, slowly add the hot water and mix until it’s well incorporated. Make sure to scrape the sides and bottom of the bowl. Pour the batter into a prepared 9 x 9 inch (23 x 23 cm) baking pan and bake for 40 minutes to 1 hour or until a toothpick inserted in the middle comes out dry. Let it rest inside the baking pan for 5 minutes, then take it out and let it cool completely on a cooling rack before serving. Hello Diana… i found ur ginger bread recipe the clearest one among all the others i collected … i will try it for sure .. but ive got a Qs… can i replace the water by buttermilk? And brown sugar instead of white? Hello Layla, you could use a combination of both, about 1/4 cup of water and 3/4 cup of buttermilk. Using brown sugar will make the bread really dense so you will probably get a different texture. Thank you Diana!😘I tried it last night and i like it! But it would have been tasted really perfect if it wasnt for that surface though! It was burnt and cracked..any idea why have I had that to my cake? 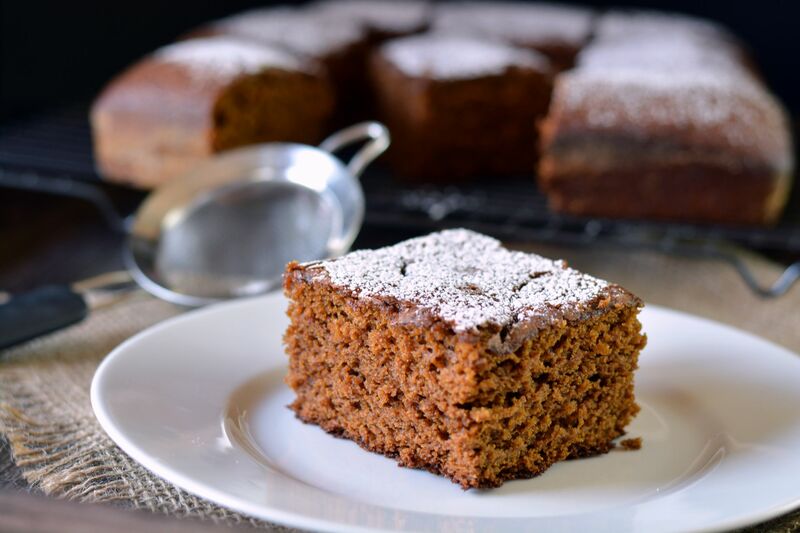 A cake usually cracks when either the oven is too hot or the pan was placed too high in the oven. What this does is cook the outer layer too quickly while the batter inside is still raw. The cooked layer traps the raw batter inside and once it starts to cook, it cracks it. can we substitute the all purpose flour with self rising flour? You know, in all honesty I have never made it with self rising flour.